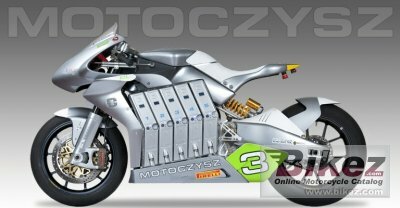 2010 MotoCzysz E1pc. Picture credits - MotoCzysz. Submit more pictures. The 2010 was a game changer for MotoCzysz and helped us understand what the future could hold. The �10 was awesome to ride, fast, stable and more fun exiting a corner than any other bike I have ever ridden. Regardless of the corner your drive was always strong, always at or near peak torque. Want 50% more torque, open the throttle 50% more, want 1% more torque, open the throttle 1% more... every corner... every lap. Rear suspension: Concentric swingarm with linked, fully adjustable custom Ohlins TTX monoshock. Comments: 330 Volt, 12.5 kWh batteries. Ask questions Join the 10 MotoCzysz E1pc discussion group or the general MotoCzysz discussion group. Get a list of related motorbikes before you buy this MotoCzysz. Inspect technical data. Look at photos. Read the riders' comments at the bike's discussion group. And check out the moped's reliability, repair costs, etc. Show any 2010 MotoCzysz E1pc for sale on our Bikez.biz Motorcycle Classifieds. You can also sign up for e-mail notification when such mopeds are advertised in the future. And advertise your old MC for sale. Our efficient ads are free. You are also welcome to read and submit motorcycle reviews.